Block’s book served as this nascent novelist’s first Bible. I read it over and over, primarily because I responded to his crisply professional approach. WNPP wasn’t full of inspirational, follow-your-bliss advice. It treated writing as a job, which made sense given’s Block background in the paperback trade of the 1950s and 1960s, and was resolutely practical. He suggested subjecting several novels in your chosen genre to detailed outlining, and I broke down more than one of Block’s own books to study the mechanics of story. 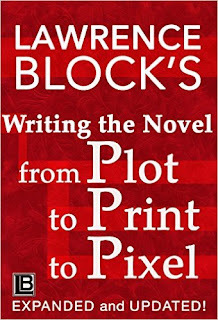 It’s no surprise Block updated his book for the modern age, given the forward-thinking approach he’s had for his entire career. He was ahead of the curve on audiobooks, embraced e-books early, and of late has self-published several titles including this one and the most recent entry in his Burglar series. That breadth of experience is brought to bear on the new and improved WNPPP. What surprises is how little revision the first fourteen chapters required. For all the technological innovations, the nuts and bolts of writing haven’t changed. Block’s counsel has weathered well, and he smartly peppers the text with interjections updating the content. Plenty of material that has served me in good stead for decades remains intact, like Block telling the story of how novelist John D. MacDonald made use of a chance meeting with a friend’s father: “By the time the evening was done, my father didn’t know too much about John D. MacDonald, but MacDonald sure learned a lot about hotel management.” I still hope to work a reference to a “tobbo shop” in somewhere. In the chapter on outlining, Block is finally able to quote an uproarious example from Donald E. Westlake’s Adios, Scheherazade that he’d previously only left to the imagination. Thanks to an assist from Duane Swierczynski a while back, I was able to read Westlake’s original, but reprinted in this context, it’s even funnier. 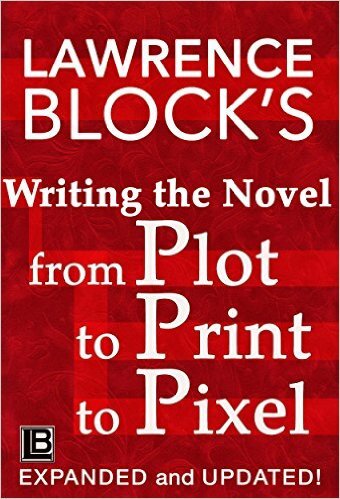 As for the book’s Pixel portion, Block wisely observes that the field is changing so fast the best he can do is offer tips on where to find the most current information. But focus your energy on what precedes it. Writing a good book is always your best first step, and Block will put you on the road to accomplishing that. First and foremost, here’s wishing a happy new year to all my loyal readers. Great to see both of you here! I’m hoping to post a bit more frequently in 2016 – be warned that more than a few of those posts will be about my debut novel Design for Dying, co-written with my wife Rosemarie under the pen name Renee Patrick and being published in April – and, figuring there’s no time like the present, decided to get things started right away. Herewith, a survey of my favorite films of the year just ended, in a somewhat vague order of preference. Mad Max: Fury Road. Throughout college, I’d argue with all comers that George Miller’s post-apocalyptic films made a better trilogy than the original Star Wars. In a year when both franchises came roaring back, my heart remains true. The Big Short. The biggest surprise of the year. Righteously angry, richly funny. ’71. 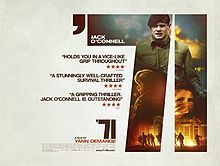 Ceaseless white-knuckle suspense as a British soldier spends a harrowing night trapped in Catholic Belfast during the height of the Troubles. Spotlight. You don’t have to be an Irish Catholic former altar boy from the Northeast who went into journalism to appreciate this film. But it helps. Saint Laurent. 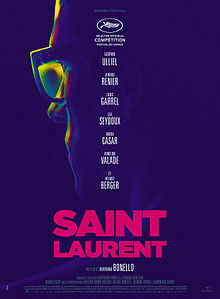 Bertrand Bonello’s sprawling, hallucinogenic biopic of the designer (not to be confused with the more sedate, authorized version which preceded it by several months) casts a spell. Office. Johnnie To directs a musical about the financial collapse of 2008. Also the strangest moviegoing experience of the year, in that Rosemarie and I were the only people in the theater. The Man From U.N.C.L.E. Maybe never seeing a minute of the TV series helped. When every other movie seems to be about building or protecting the brand, it was a relief to see one hell-bent on feeling gleefully offhand. (The boat chase is a thing of wonder.) A stylish movie that is about style – Henry Cavill wears a blue 3-piece windowpane plaid suit that’s like a special effect – and Daniel Pemberton’s soundtrack is one of the year’s great accomplishments. If they won’t make any more of these movies, I hereby volunteer to write a series of tie-in novels featuring the Cavill/Hammer/Vikander/Grant team. The Gift. Classic noir in modern duds, served up by Joel Edgerton. Trainwreck. Amy Schumer’s script is tough on her character while not skimping on jokes. Plus, Mets references aplenty! Magic Mike XXL. The original film was my favorite of its year. The sequel is looser, more shambolic, and even funnier. Steve Jobs. Uncut, prison-grade Aaron Sorkin and a dazzling Michael Fassbender performance. Iris. Documentary master Albert Maysles’ final film is, fittingly, about staying curious and true to yourself – and looking good while you do so. Love & Mercy. A daring dual turn by Paul Dano and John Cusack as Brian Wilson, with Elizabeth Banks carrying the day. Phoenix. If I’m undervaluing a title on this list, Christian Petzold’s melodrama may be it. At times too sedate for its own good, but Nina Hoss is transcendent – and the final moments are absolutely shattering. Mr. Holmes. A meditation on memory and regret, filtered through one of the most iconic characters of all time.